Yes, YouTube SEO exists. Surprised? Don’t worry – we were, too, when we first delved into everything SEO-related. We thought Search Engine Optimization? Easy – it’s all about Google. While Google is the single most used search engine in the world, it’s obviously not the only one. To list a few, there’s Bing, Yahoo, ask.com, AOL, and so on. YouTube, however, differs from those search engines because YouTube is specifically a video search engine. Ask yourself, what drives YouTube? It’s their huge, smack-dab-in-the-center search bar that offers search suggestions as soon as you begin typing. And those search suggestions are keywords, which are single-handedly and arguably the most important part of YouTube SEO. But we won’t be getting into the specifics just yet. First, let’s talk about your business and YouTube. If you already have a channel on YouTube, you know the point is to get viewers who will then become subscribers. Those subscribers will eventually follow you on other platforms and visit your website. And if you’ve done a perfect job, those viewers-now-subscribers will become your clients or customers. That’s the whole point of a business YouTube channel. If you’re trying to decide whether or not YouTube is for you, just consider that, according to Forbes, “By 2021, it’s estimated that 82 percent of all internet traffic will be for video. And if you think that sounds unrealistic, consider that it accounted for 73 percent of traffic in 2016.” YouTube presents your business and brand a way to introduce yourselves and your product in a wonderfully creative way. As for content marketing, not everything is about text these days. Thousands of videos go viral every day. Your video could be one of those! 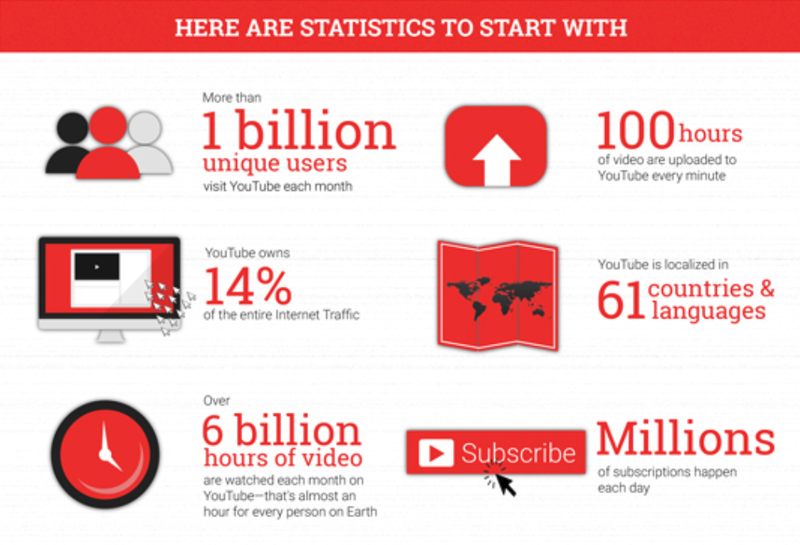 But what steps can you take to ensure your YouTube videos are ranking highly? Keywords: As mentioned before, keywords matter a lot. You need to spend a good amount of time researching the keywords you want to optimize for. These keywords are then put in the title, description, and tags. They help your viewers get to your video, and the more viewers you get, the higher YouTube will rank your video. Don’t just blindly pick your keywords–make sure they align with your brand first! Title: Next to the keywords is the title. It’s what gets your viewers to click on your video! You want to make sure it’s to the point and attention-grabbing. Include your keyword in the title. Make sure your title is not too long. Leverage your title, and most of your YouTube SEO work will come after that. Thumbnail: This goes hand-in-hand with the title. It’s one of the first things your viewer will see, and it’ll determine if you get clicks. First, make sure the thumbnail of your video is a quality image. You don’t want it to be blurry or irrelevant. People are drawn to click if something visually appeals to them. You can, and in fact should, make custom YouTube thumbnails that capture your brand. Description: We’ll probably cover YouTube descriptions more in depth at a later time, but for now, these are the most important factors to keep in mind. Use your description to first describe the video. What’s the viewer going to see or learn? Keep it short and sweet. If you’re able to catch your viewer’s attention, they’ll click the “See More” button located in the description area. This is where you want to add links to your website and your social media channels. Adding those calls to action are bound to get you more engagement! Tags: YouTube tags are important to YouTube SEO because they give necessary information about your video to YouTube and Google. You want to add as many tags as are relevant to each individual video. Make sure your first tag is your keyword! And then make the rest of your tags other keywords you’ve identified. To help you navigate the world of YouTube SEO, YouTube created an online course you can complete at any time. It’s a good starting off point, and we encourage you to check it out! We know this can be overwhelming and new. But it’s the future. And the sooner we learn how to use videos for our businesses, the sooner we’ll see leads and growth from our efforts. Comment below if you have any questions or comments! And as always, if you’d like some help, please contact us!